"It frustrated me that people thought they could box who I was, so I rebelled." DJ Fresh: "no one's opinion is wrong in music." 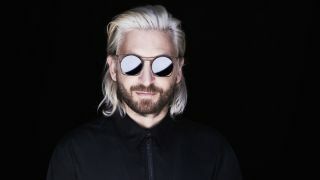 Bass music maven DJ Fresh (AKA Daniel Stein) has already racked up a couple of UK number ones, and has previously worked with the likes of Rita Ora, Ellie Goulding and Dizzee Rascal. His latest signal, Bang Bang, sees him collaborating not only with super-producer Diplo, but also R. City, Selah Sue and Craig David, so he may well have another hit on his hands. "If you're a musician then you're immediately in a risky reality. Increasingly so these days. So don't waste it by faking it. Let your individuality flow through, as that is what will stand you apart from the army of tutorial-fuelled copycats. If you're going to make music for money, you're in the wrong game. Get into banking. Keep it real yo." "I often think, having experienced several different successful musical entities, that I've missed a trick by trying to be different all the time. Once you've established yourself with a sound, If you do what people expect then generally they will love you for it… for a while. "Some people take the approach of sticking to their guns until their time comes back round. I get bored doing the same thing. But it was more like that back in my Bad Company UK days. It frustrated me that people thought they could box who I was, so I rebelled. "There is a lot to be said, however, for establishing what you are by reinforcing your sound and, ultimately, having one." "Music is a collaborative effort. No matter what anyone says, we all copy people. Knowingly or unknowingly. Being influenced allows us to move forward as a whole. "Every opinion is important. Your sister is a music buyer. So is your mate who likes music you think is awful. If you have two tracks you love equally and you're going to push one, get other people's input. "No one's opinion is wrong in music. Collaborate and listen. And you could be the next Vanilla Ice [facepalm]." "The music 'business' is tougher and more competitive than ever. Whatever you choose to do, there will be someone somewhere doing the same thing working harder than you. If you're going to look someone in the eye and proudly tell them you're a '......' (singer/guitarist/producer), be professional and work hard. And then no matter what happens you can be proud of yourself." "Really tough. I've been through so many phases of music and isolated many followers along the way. It makes me very sad to be responsible for that. But you have to do YOU because you will never be truly great at being anything else."